“The public is led to believe that companies can’t find Americans to fill high-tech jobs when, in fact, they are not searching for Americans — as these ads show,” said Donna Conroy, a founder of Bright Future Jobs and author of No Americans Need Apply. The Bright Future Jobs analysis of the ads found 37 percent of them made no mention of IT job terms or skills in the ad title. Instead, they contained only references to visa types, says Conroy’s report. “These 37 ads also repeated these USCIS (U.S. Citizenship and Immigration Services) terms in the skills section,” says the report. Referred to as body shops, these mostly Indian-owned IT staffing firms recruit in India, promising jobs and training in the U.S. Hopeful candidates pay for the placement — as much as $10,000 Conroy said — and go to work for a staffing firm that arranges their work visas. 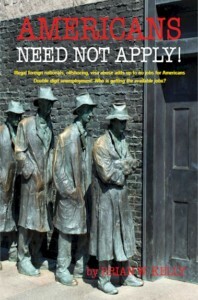 Contrary to popular belief, few jobs must first be advertised to American citizens. Although salaries and opportunities have risen sharply in India since the emergence of body shops in the mid-1990s, IT graduates there find so much advantage in gaining overseas experience, that they are willing to pay the fees and even endure often uncomfortable periods of unemployment — with no pay — living in housing that may be owned by the staffing firm. How widespread a problem this is isn’t known, since no agency is specifically charged with monitoring and tabulating all the various visas issued and which are still active. Conroy suggested it is into the tens of thousands.